I used to work in early childhood education. I used to write lesson plans each week on a theme using the creative curriculum model. It was sort of fun, but sort of brain-wracking. I wrote them in the days before Pinterest, and I’d often find myself googling little projects in my off-hours. Now that I’m not in ECC in that capacity, but do have little ones of my own, I try to work all of the elements of the curriculum into our week, as it’s constructed in a way that hits on a lot of areas of development. 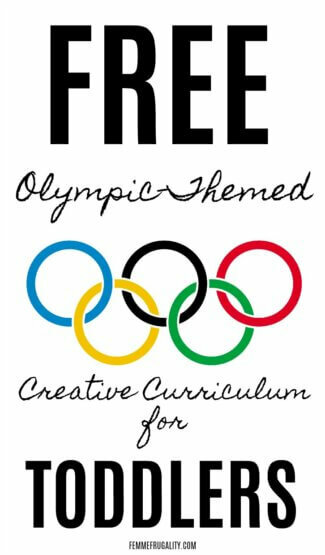 Here’s a lesson plan that incorporates all creative curriculum areas. We were able to do it without spending a penny–we just used things around our house for each project. Feel free to mix and match according to what you have lying around your home. For example, maybe you don’t have model magic, but you do have Play-Doh. Or maybe you’re like me and hate glitter, but you’re lucky enough to have some gold paint lying around the house. We made snowboards out of model magic. Before they dried, I twisted up some pipecleaners to make snowboarders and stuck their feet into the boards so they’d dry standing up. Snowboarding is the favorite event for my kids, but you could easily make skis out of either popsicle sticks or model magic. 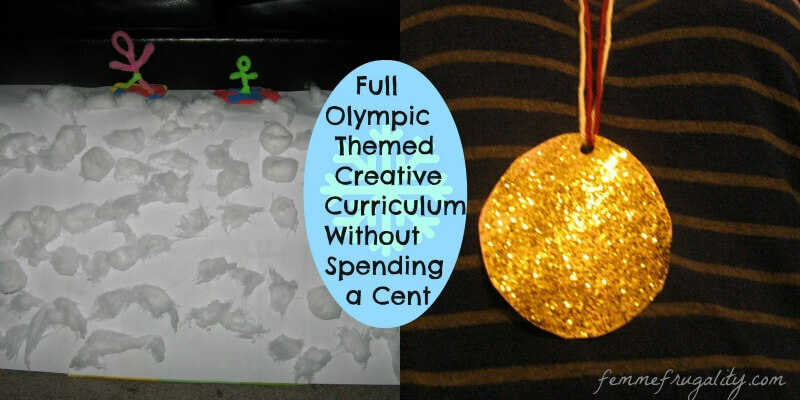 We also made gold medals by gluing a ton of gold glitter to a piece of card stock. Wait to dry. Cut out a hole with a hole punch. Use some yarn to make it into a necklace. Done. I cut out the side of an old diaper box, glued some white paper on it, put some glue on the paper, and let my kids go crazy ripping up cotton balls and placing them on the box to make 3D snow. It made more sense on my Pinspiration where she made skiiers–the cotton balls were moguls. Regardless, we had fun. We had made our own manipulatives with our snowboarders! The day everything was finally dry we took our little dudes down the diaperbox mountain. And pulled the snow back off the mountain. And made them crash into each other. And then sent them down the naked mountain again. After our snowboarders made their runs on the diaper box course, we got out the stool we use to wash hands and used it as a podium. Everyone got a gold medal. Not because I think “everyone should be a winner,” but because we’re way too little around here to handle the concept of losing to a sibling and still have fun. What did we sing on the podium? The Star-Spangled Banner, of course. When that got old we sang France’s national anthem, because that’s the only other one I know all the words to. By National Geographic AND focuses on literacy-which is awesome. You can also head to your library and see what they have for free. GO PLAY IN THE SNOW! Luge with a sled, pretend to cross-country ski, or simply talk about how that white stuff they’re throwing around is the same stuff under the snowboarder’s feet on TV. I’m not going to lie, we haven’t done this one yet. These Olympic Ring Fruit Pizzas look simple and delicious, though. Or, you could make a Korean dish like kimchi. We’ve got a couple weeks left, so I’m keeping this in mind for our next grocery shopping trip. 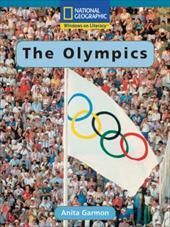 How will you celebrate the Olympics? This entry was posted in Family Finance, Ways to Save Money on February 7, 2018 by femmefrugality. These ideas are so cute! And smart…way better than my lame suggestion to get them into the Olympics by bribing them with lollipops–thanks for always have such neat ideas, friend! What a good mom you are! I suspect that when they’re older, your kids will always love the Olympics. This kind of teaching instills an appreciation that sticks. A gold medal for you!